My dream horse was always a pure black with a small star and an angled snip. 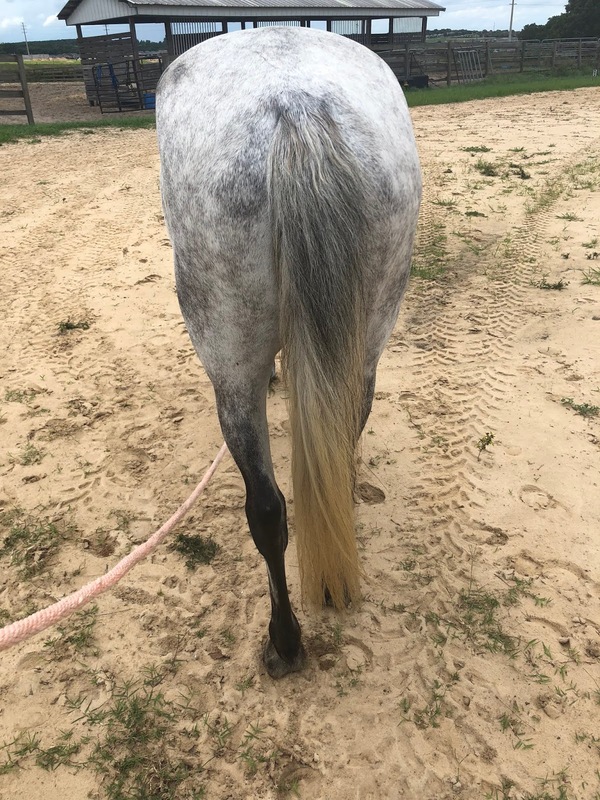 Owning a grey was the complete opposite end of what I wanted. 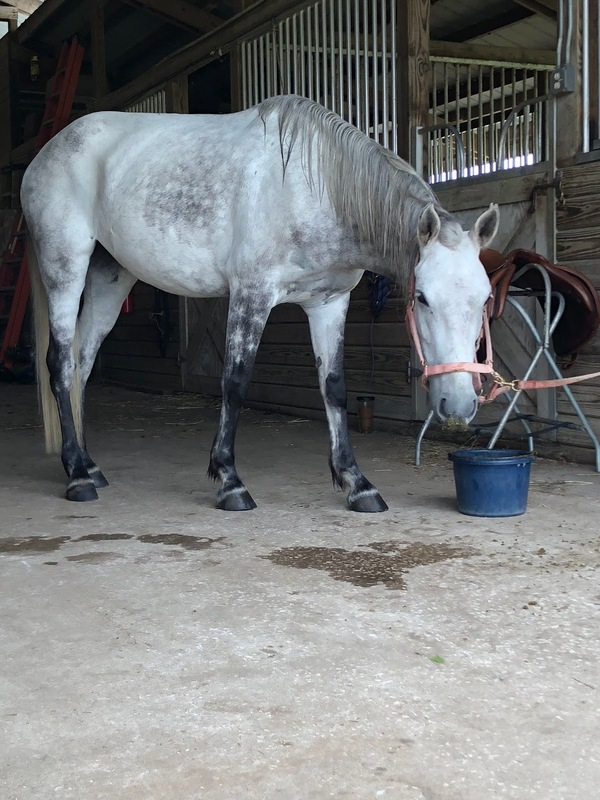 Grey horses are a pain to get clean and seem determined to be as stained as humanly possible. Cupid, thankfully, is a bit picky about where she rolls and lays down. Plus she has a HUGE mud/water/pee spot phobia so I don't need to worry about those stains! But no matter how prissy my girl is I still have to deal with the typical grey stains, including a lovely yellow stained tail. 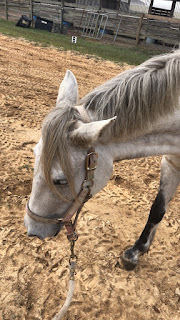 Thus, I introduce the new post series "Grooming the Grey". *Note* Please use all suggestions with caution. I can only speak to my own experiences with all products recommended. Hours of digging through Chronicle of the Horse led me to discover several alternative methods for cleaning stains out of a grey horse. One of the stranger methods involves soaking their tail in ketchup. Supposedly the acidity of ketchup pulls the yellow stains from tail hairs without causing as much damage as bleach. Because I had an expired bottle of ketchup in my fridge I figured this would be my first try at turning Cue's lovely grey/white, black and yellow tail into grey, white and black. 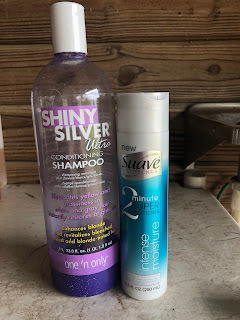 Step one was to shampoo the tail with Shiny Silver Ultra from Sally's Beauty Supply. This was on sale last year so I grabbed a few bottles. It does brighten Cupid's coat and mane, but only takes a little bit of the yellow staining out of her tail. I figured a clean tail would allow the ketchup to penetrate better. After the shampoo was completely rinsed out I coated it with ketchup. Naturally, Cupid kept swishing her tail getting ketchup water all over the barn and me. Because the bottle was almost empty I stuffed her tail into the ketchup bottle as far as it would go. I did not go past her tailbone because the staining was not too bad at that point and I did not want to irritate her skin. 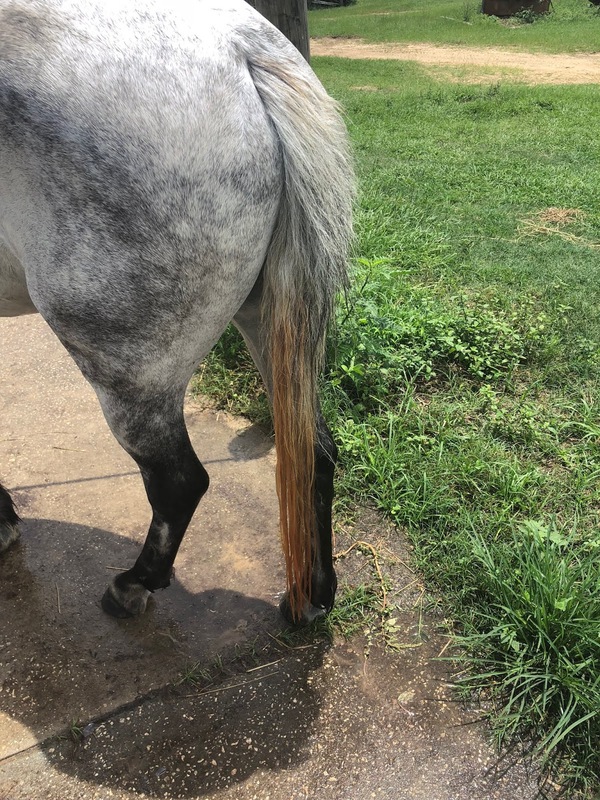 The ketchup sat on her tail for approximately 10 minutes while I stuffed her full of carrots. 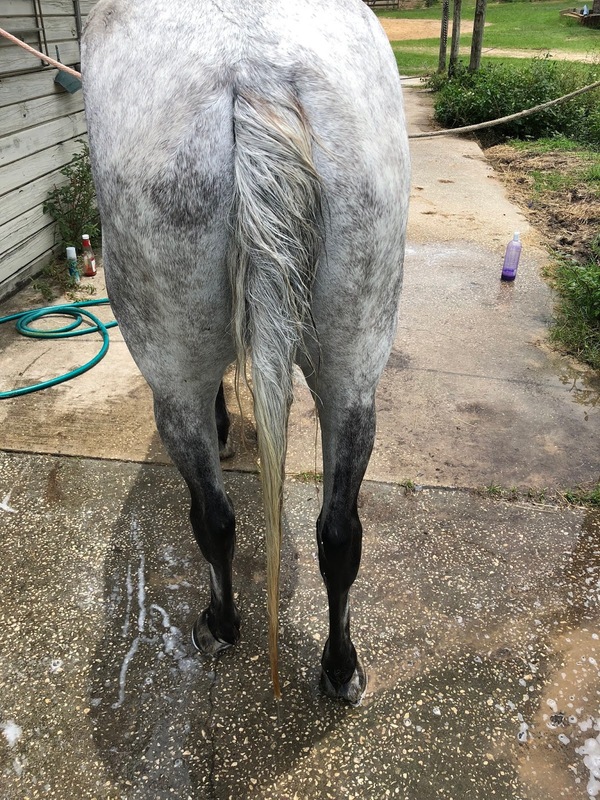 Because I wanted to ensure that it was all removed I reshampooed her with the Shiny Silver after I rinsed the ketchup out. I was also afraid of her tail smelling like ketchup and getting eaten off by one of her pasture mates. After both shampoo and ketchup were completely rinsed out I covered her tail with a deep conditioner. I used Suave 2 Minute Super Conditioner Intense Moisture because it has been hanging out in my shower forever and I wanted to see it gone. 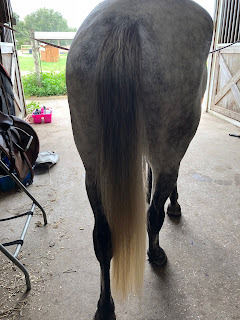 Once the conditioner was rinsed out and her tail was dried I was pleased to see that the yellow was faded more than shampoo alone would have done. and that her tail was not dried out. It was easy to comb through and felt healthy. 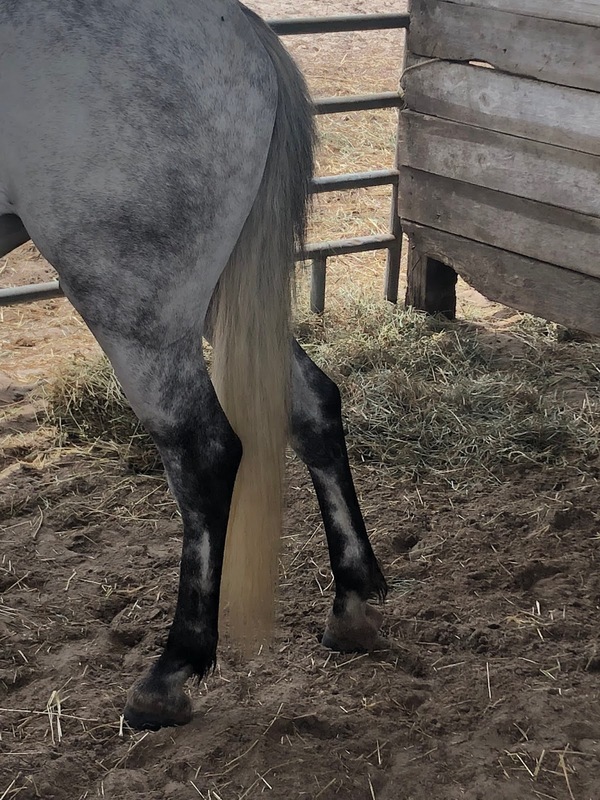 Overall, I don't believe the ketchup would have been a good last minute treatment before a show but it was a good "get the tail back to normal" option. I would do this again, but next time I would attempt to leave the ketchup in longer.